The Neoss® Guide solution provides a uniquely versatile method. Used together with the standard Neoss surgical kit, the Neoss Guide Kit minimizes the number of components needed for guided placement. 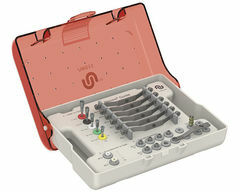 The Neoss Kit is designed to achieve safe and accurate drilling and implant placement. 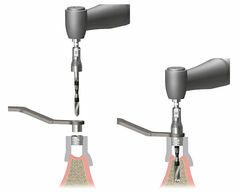 Drill “hubs” ensure a complete stop when drilling, countersinking, and during implant insertion. Case planning is made in your existing planning software and the guide is manufactured by your preferred guide provider. 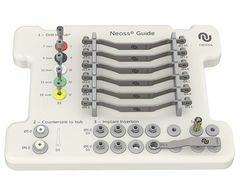 The Neoss Guide Kit provides a fully guided solution for surgical preparation and implant placement of Neoss implants. Fully guided drilling and implant placement can only be achieved with a sleeve position of 9 mm (S9) using existing Neoss drills with subsequent placement of Neoss Implants Ø3.5 - Ø6.0mm of 7-15mm lengths. Neoss Guide components are provided as a kit. Additional components and spare parts are available as standalone items. See Product Catalog and Neoss special products and spare parts for order details. The Neoss Guide Kit includes 5x drill-hubs, 2x countersink conduits, 4x implant mounts Ø5.0 S9, 2x implant mounts Ø6.0 S9, 7x guide keys, 3x guide key adapters and 1 holder guide key adapter. 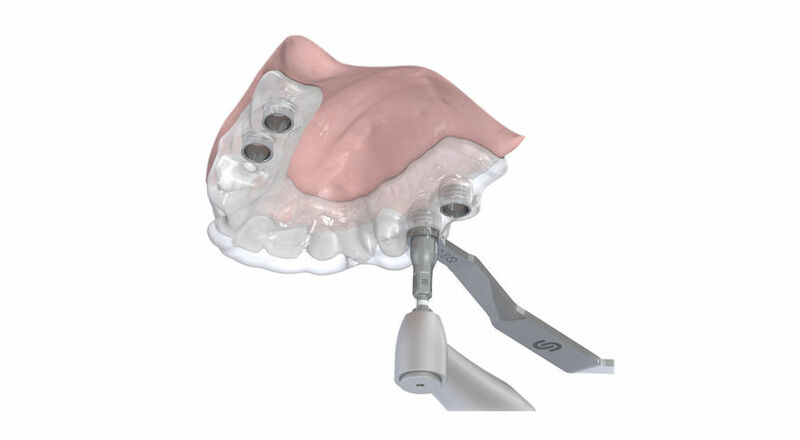 The Neoss Implant and the Neoss Guide Kit are only included and compatible with certain surgical planning software. In addition, surgical placement using the Neoss Guide Kit requires a Ø5.0 mm Guide Sleeve (Neoss® Implants Ø3.5, Ø4.0 and Ø4.5 mm of 7-15 mm lengths) or a dedicated Neoss Ø6.0 mm Guide Sleeve (Neoss Implants Ø5.0, Ø5.5 and Ø6.0 mm of 7-15 mm lengths where applicable). The Neoss Ø5.0 mm Guide Sleeve is recommended while the Neoss Ø6.0 mm Guide Sleeve is required due to its compatibility with the Guide Key Adaptor. For Fully Guided, which provides fully guided implant preparation and placement with stops(Hubs) for all process steps, the guide sleeve position must be set at 9mm (S9). For all procedure details please see Neoss Guide Kit Instructions for Use.